Alejo Duque (Switzerland / Columbia) is an artist and PhD candidate at the European Graduate School (http://www.egs.edu). Dedicated to experiencing all possible ways for collaborative/participatory arts that celebrate cultural agitation across varied networks. Mostly on a South to South axis. His current interests deal with HAM radio -HJ4ADJ-, streaming media and victorian age satellite technology. Member of networks such as Bricolabs, dorkbot, labSurlab, Locus Sonus research lab and [k.0_lab]. Easy to spot on the IRC networks as dspstv. Alejandro Duque artiste colombien est diplômé de l'École d'Art de Medellin en Colombie et de l'Université des Beaux-Arts de Cuenca en Espagne. Il est actuellement doctorant en thèse de Philosophie de la Communication en Suisse à l'EGS (European Graduate School http://www.egs.edu/). Il est membre du post-diplôme laboratoire Locus Sonus depuis 2009, http://locusonus.org/ . Sa recherche traite du piratage et de la manière dont les idées sont pillées sur les réseaux (sociaux, internet..) et comment des concepts de communautés marginales sont détournées et confrontées aux philosophies du monde occidental. Ses centres d'intérêts tournent principalement autour des technologies et des logiciels libres. En Colombie il a mis en place un réseau communautaire sans fil et ouvert un "Hacklab" (dorkbot-medellin [k.0_lab] où toutes sortes de projets "indisciplinés" y ont été développés. 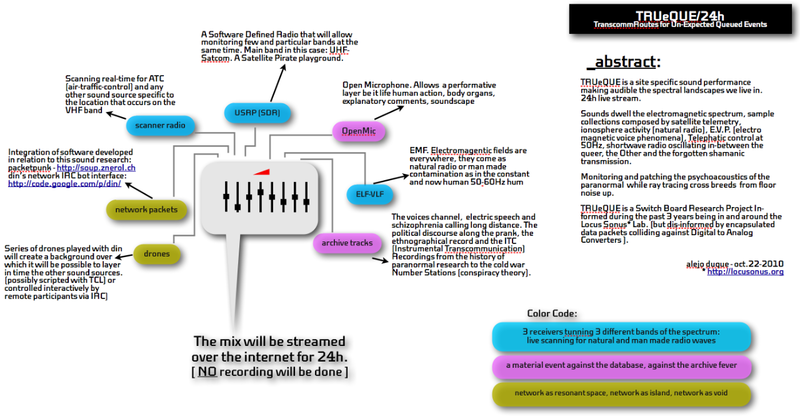 Alejandro Duque s'intéresse principalement aujourd'hui à des sujets liés à la sonification de données, le streaming, et les projets collaboratifs en réseaux. II travaille sur des plate-formes Linux, les applications chat IRC tiennent lieu pour lui de "seconde vie" . Les technologies sans fil et gps font partie de son champ artistique d'expérimentation. Il a participé à de nombreux événements internationaux : TransMediale, WJs-Spots, Video Vortex, Wintercamp09, Biennale d'Architecture de Venise, Piksel, Art+Communication, labSurlab, Festival Shift, Insecure Territories, Mal au Pixel (Gaîté Lyrique), Pool09, etc. A short series of applied artistic exercises based on the historical timeline that attempts to describe varied uses of technology to transmit, communicate, bond or affect across, the usually deﬁned, "long distances". With the intention to produce a sound-works based on the research initiated by Jerome Joy -Networked Music Timeline-, I propose investing time and energy to review it and in the process identify particular moments that could be revisited and followed as inspiration along as researching further deep and helping to make the NMT grow. Streaming, Electromagnetic Wave, Radio, Transducer, Antenna, Map, Perception, End of Ideology. Develop both, theoretical research as long as a practical applications formalized in sound based works using technics of data soniﬁcation. Departing from previous experiments using recordings (from internet streams and sound databases available on the web that relate to issues regarding political, colonialist, propagandist or ecological to name a few, any kind of technology used in relation to some clear ideological agenda, A selection of sounds of a contemporary political discourse, that of , sounds that come from humans walking on the moon to wax recordings from a tropical jungle. Sounds to be chosen following an anarcheological methodology (http://www.neural.it/art/2006/05/siegfried_zielinski_deep_time.phtml ) that could not only put in place the question of the sound and its context but help re-think and re-map a different vector for the NMT. Start with a ﬁrst hands-on project using a collection of sounds i have already collected (around 50 tracks that comprehend political demos, telephone tapping, ﬁeld recordings, aboriginal sounds...), a data base that can help me introduce and articulate both in practical and theoretical way the terms with which i will work, this way the rest of the Locus Sonus group can have ther take and help build a collaboration. Such feedback will enrich the project and provide me with enough material to generate a revision of the ﬁrst model presented. The second presentation will be then a ﬁnal one during the research period. The whole process will be documented to share via the locus sonus website patches and scripts related to the control of the sound system and the network ﬂow in the case of real-time processing. All written text will be part of my dissertation project for EGS with all the credits given to Locus Sonus. Making use of sound samples from a varied set of origins that i have already collected in the last 10 years, set up to create the possibilities of a personal mental map through the use of a pre-deﬁned network of relations that obey to psychological and cultural conventions. A trajectory of sounds related to a certain particular artistic motivation that could well also be a critic on how technologies exploit humans and not the other way round. On the theoretical side, this will open the topic of the possibilities of mapping using sound. Technically the work will be presented using a axis spatialization driven by a puredata patch. 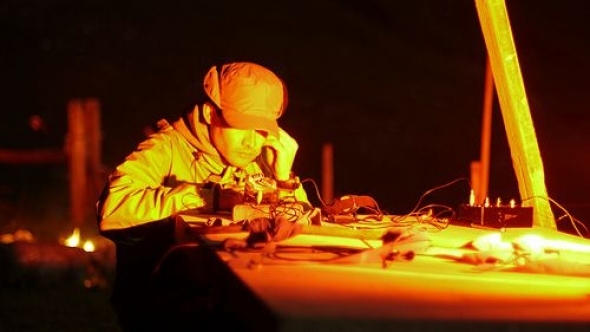 Even though there might be connections to the use of 3d engines to drive the sound synthesis there will be no visual representation present since it will be focused on the potentials of sound to guide and follow a trajectory. Imagine a roller coaster that passes from one underwater to outer-space and one has just sound images. Tracing translocal connections based on streams of data that will affect the acoustic characteristics of an speciﬁc site, the place where one will listen to the piece will be radically affected by the way sounds get introduced on it in realtime and from diverse locations. Using techniques and devices for data sensing (enumerated below). A quest into the invisible spectrum, from bio to radio electromagentic waves, from electrosmog to esoterism, sound as a medium for faraway calls. Since the framework for the research has already been traced, thanks to the experience in the previous year, we will have to deﬁne during the ﬁrst month how to integrate the different aspects that touch on this particular project and to achieve a practical set up that will be presented at the end of the research period. The ﬁrst 2 weeks will be dedicated to a profound study of the NMT, to ﬁnd on it related topic and common interest, the next to weeks will be for setting up the ﬁrst piece. after collecting input from the members of the Lab and others around, the project will head to develop a system that can integrate some of the stronger remarks plus develop software and resources needed to accomplish a second setting. The whole month will be dedicated to both theoretical production and project development. the ﬁrst 2 weeks could be dedicated to work on the infrastructure of the NMT, helping to make it more visible and documenting some of its potential uses. the last 2 weeks will be dedicated to setting up the ﬁnal presentation piece. Triﬁeld electromagnetic sensors, DIY scrying board. Crossing my contributions in the development of the streambox and its community what has become my favorite hobby, radio scanning the UHF-military band. 2-raw network packets passing through the adc and bouncing back alog with the packets that cache the sound. (this means, i will like to put in parallel the sound of the open mic with the sound of it data packets passing thought the network by the use of scheduled cron jobs). TRUeQUE is a word that in French language will relate to what the meaning their word 'troc' could express: “An exchange of value” be it material or immaterial (services, trust, knowledge/know-how, affections, impressions, critique, but usually goods. In the case of ancient Colombian tribes, it was salt, emeralds or even gold. This practice has been an economical pillar for varied types of communities in the planetary South and elsewhere. It is even more so relevant to explore it in the break of the current so called “crisis of capitalism”. 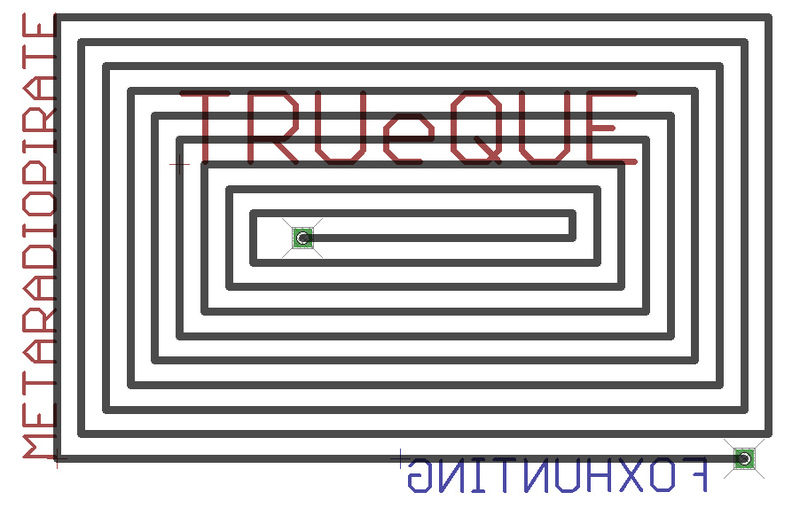 During the last year of research the concept and approach surrounding TRUeQUE has evolved from being enacted in praxis as a 24h continuous sound stream across the 'internets' (an on-line sound based project) relaying flows and feeds and performed in a way that somehow expands the task of the switchboard operator. Here today, no long a due, it is conceived as an event taking place in an “alternate” reality, that is, in the mix of on-line and off-line packet exchanges. 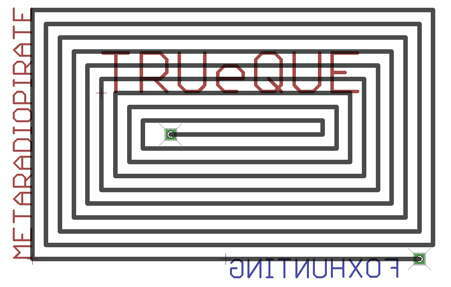 At the core, TRUeQUE is an attempt to build an infrastructure for and alternative communication system to be deployed as a game/workshop closely tied to the ideas and the practice of sound-walking. TRUeQUE est un terme qui en français peut se rapprocher de "troc" : un "échange de valeur", matériel (un objet) ou immatériel (un service, une connaissance ou une compétence, une impression, etc.). Pour les anciennes tribus colombiennes, les échanges concernaient le sel, les émeraudes et parfois de l'or. Cette pratique de l'échange a été un pilier de l'économie de différents types de communautés dans les continents du Sud mais aussi un peu partout dans le monde. Il est essentiel d'explorer cette notion au moment même de ce qui est appelé la "crise du capitalisme". Durant cette dernière année de recherche au sein de Locus Sonus, les problématiques et les approches autour de TRUeQUE ont impliqué plusieurs pratiques et activités. C'est le cas du développement d'un projet sonore en ligne comprenant des streams continus 24/24h à partir de flux et de données glanés sur les "internets". Cette activité pourrait se rapprocher de celle d'un opérateur "artistique" sélectionnant au sein de données invisibles et les amenant à un certain niveau de visibilité. Aujourd'hui, et il n'y a pas si longtemps encore, ceci était conçu et vu comme une activité produisant un événement ayant lieu dans une réalité "alternative" issue de mixages d'échanges de données en ligne et hors ligne. TRUeQUE est principalement une tentative de construction d'une infrastructure pour des systèmes d'inter-communications alternatives. Ces systèmes peuvent se déployer en tant que jeux ou activités proches des intentions et de la pratique du "soundwalking" (ou "promenade sonore"), cette dernière impliquant une sorte de psycho-géographie ainsi que des modes de perception "émancipée" dans une réalité plus grande qu'elle n'y paraît.